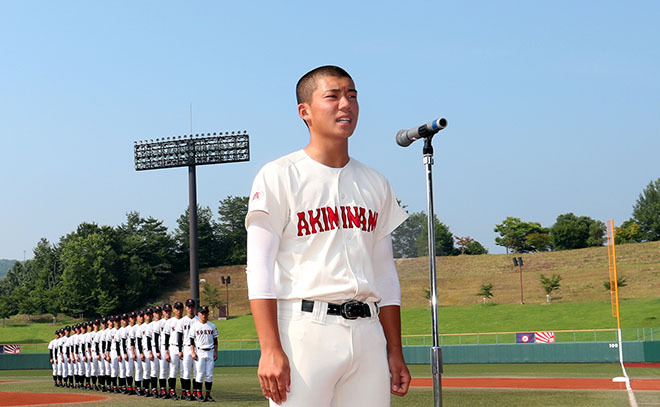 Toi Tashiro, captain of the Aki-Minami Senior High School baseball team, recites his athletes' pledge at the opening ceremony of the Hiroshima prefectural tournament on July 17 in Miyoshi, Hiroshima Prefecture. THE ASAHI SHIMBUN　July 17, 2018 The annual high school baseball prefectural tournament got off to a belated start in Hiroshima Prefecture on July 17 following the torrential rains that killed more than 200 with an opening ceremony marked by an athlete's poignant pledge. The tournament’s launch event should have been held July 7 at Mazda Stadium, Hiroshima Prefecture, with all 88 teams taking part. However, the heavy rains and flooding delayed it by 10 days, making it the last of the prefectural tournaments to start this year. Only the two teams facing off in the first game later in the day lined up for the ceremony, and the venue was different, too, with the ceremony held at Miyoshi Kinsai Stadium in Miyoshi in the northern part of the prefecture. The athletes' pledge was read by Toi Tashiro, captain of the Aki-Minami Senior High School team. When the draw for the prefectural tournament was held on June 23, Tashiro pulled out the No. 1 marker that gave him the right to read the pledge. He consulted with teammates and the head coach and decided on his draft remarks. However, the devastation from the rains and flooding would force Tashiro to rewrite the pledge. "I come from the community of Yano (in Aki Ward)," Tashiro said in his remarks. "On the morning of July 7, what I saw before me was not the Yano that I knew." But he also pointed out that this year's national tournament is the commemorative 100th edition. "This tournament will provide an opportunity for us to show how much we have grown and to display our fighting spirit," he added. "We will play with all our might in order to provide courage and strength to the disaster victims." Hiroshima Prefecture was especially hard-hit by the rains and flooding with 111 fatalities as of 5:15 a.m. on July 17. That is exactly half of the 222 deaths confirmed so far mainly in western Japan. Soon after the rains ended, Tashiro had other things on his mind than baseball. He and 12 friends helped to clear away dirt and sand from the vicinity of their former elementary school. That was when Tashiro learned that Shotaro Ueki, a former junior high school classmate, was one of those listed as missing. From the morning of July 11, Tashiro joined in the search for his buddy along with more than 100 former classmates and teachers. His friend has not been found, but Tashiro and his teammates at Aki-Minami Senior High School resumed baseball practice from July 15. Although many had suffered damage from the rain and flooding, Tashiro felt greater team unity along with each player thinking for himself about what he had to do. The opening ceremony where Tashiro read the pledge was a solemn affair, as flags were flown at half-staff and a moment of silence was observed for disaster victims. According to the Hiroshima prefectural board of education, 16 prefectural high schools entered in the tournament suffered damage from landslides to their buildings or baseball fields.